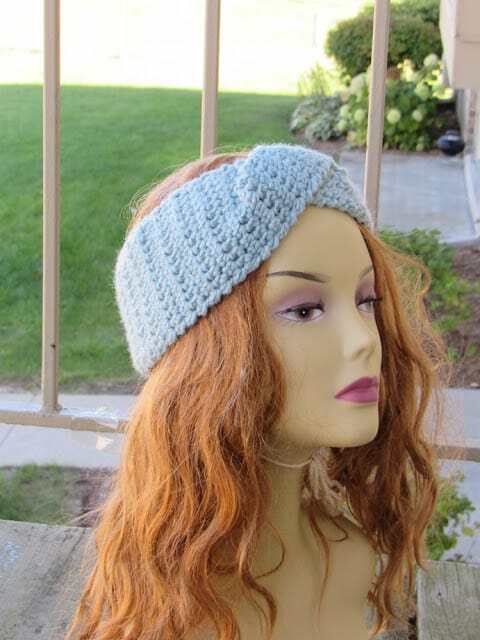 You can work from the free pattern below or purchase an Ad-free PDF copy for $1.99 here. 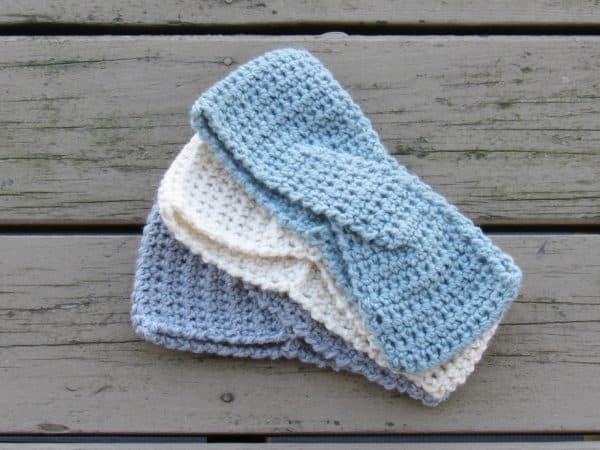 This Twist ear warmer crochet pattern uses the same extended single crochet stitch used for my Brooklyn mittens and boot cuffs. I eliminated the chains in between to make a denser fabric for more warmth. This works up in less than one hour and would make a great item for last minute gifts or craft fairs. 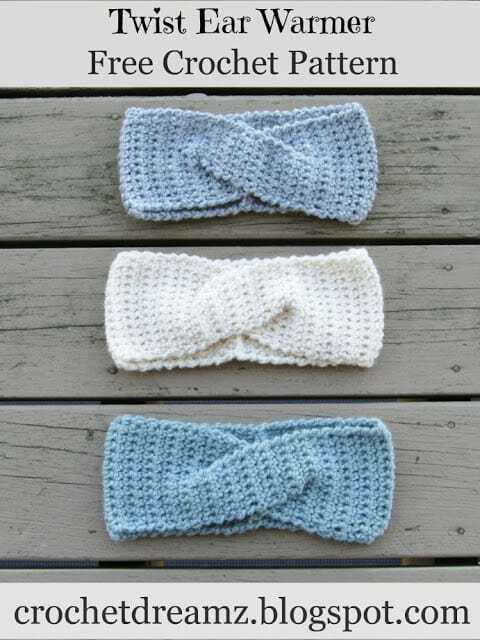 I used my favorite yarn, Lionbrand Wool-Ease for the samples. Any light worsted weight yarn should work. I hope you like the pattern. 1. Light worsted weight (size 4) yarn. I used Lionbrand Wool Ease. 3. Tapestry needle to weave in the ends. 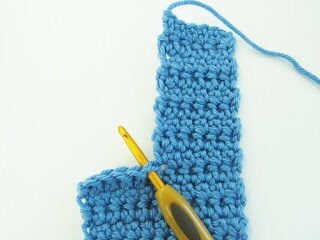 Reverse Single Crochet: This is single crochet stitch worked in the opposite direction to create a bumpy edge. 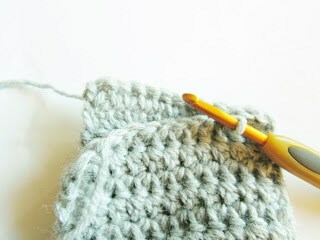 Insert your hook into the st on the right, pull up a loop, YO and pull through 2 loops on hook. 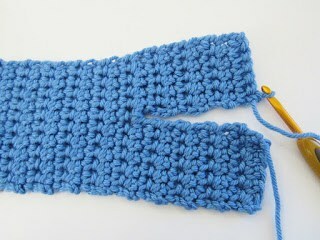 Repeat Row 2 until your work measures 8 1/2 inches for Size Preteen to Adult Small and 9 inches for size Adult Medium/Large. 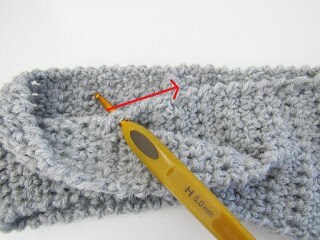 Repeat the above row until the strip measures 3 inches, fasten off. Repeat the above row until the strip measures 3 inches. Now cross the strip on top over the one at the bottom to form an ‘X’. I tried crossing the bottom strip over the top one too but found that the first option looks far better for some weird reason. Now, if your working yarn is in the middle after crossing, you will have to fasten off and join new yarn at the outer edge of your strip. If it is already at the edge like in the picture above, continue working with it. Row 2: Ch 1, Ch 1, 1 esc in same st as ch 1, 1 esc in next 11 sts, turn.———12 esc. 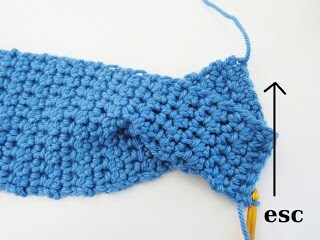 Repeat Row 2 until the total length of the headband is 20 inches for the smaller size and 21 inches for the bigger. Do not fasten off. Bring the foundation row edge near the last row and sl st both these sides together. Fasten off and weave in all the tails. Lift your twist and sl st to the base of the strip, work a round of reverse sc along the edge until you hit the top end of the strip, fasten off. The picture above was taken after the reverse sc border was finished. Flip your headband, lift your twist again and start reverse sc at the base of the second strip and continue all along the edge until you hit the top end of the strip, fasten off. Enjoy wearing your new Ear Warmer! is happening to them as well? This might be a problem with my web browser because I've had this happen previously. Did you try with a different browser? So far I haven't had anyone complain about this. Sorry to say but I made one of theses for my daughter. She wore it to work. Then a lady on 3rd shift wanted one . so I made it. Now I have orders for 6 more. I am going to be busy. Hi Debbie, your comment made me laugh. I hope you are enjoying making it.